Heritage Horse – Hall of Fame – Nominations due soon! Nomination are due by September 5th! This year (2018) the EAS has created the Erin Fair Horse Hall of Fame, organized by the Erin Fair Equine Tent Committee. The Horse Hall of Fame intends to recognize, celebrate and support organizations, people and horses in Erin have made an outstanding contribution to our horse community. Each year, one group, horse or individual will be selected, and honoured at a ceremony in the Equine Tent at the Erin Fair. We are looking for nominations from our Erin Community, please see criteria listed below. Nominations need not meet all of the listed criteria. We are open to your suggestions and stories. Our goal is to better understand the history of horses and the people who have built maintained our Erin horse community. In addition, the committee has decided to have some fun, and will be recognizing our professional, industry and/or recreational horse sector in the following categories*. 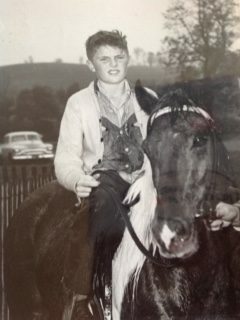 Erin Horse-Tales: Best Old-time horse story: Do you remember driving your team to Erin for an ice-cream at Steen’s Dairy? If so, please tell us about it. *Photos appreciated, please send copies—or identify if you require your photo returned. Selected nominee will be notified prior to the Erin Fair and invited to attend a special recognition ceremony on Saturday October 6, at 11:am in the Equine Tent. The Erin Fair, was established in 1850, and is a charitable organization which is owned and operated by the Erin Agricultural Society, welcoming 25-30,000 visitors annually, each Thanksgiving Weekend. The Equine Tent at the Erin Fair was established in 2010 and has become an integral and important event and at the Erin Fair. The Equine Tent provides a hands-on horse experience to 12-13,000 visitors each year. The Erin Fair has a commitment to providing agricultural education and awareness towards Erin’s agricultural community. The Equine Tent focuses on horses, education, and showcases our local horse community.